Broccoli florets and julienned sweet potatoes surround delicate white fish kept moist and tasty with the springy tang of a cilantro broth. In cup of immersion blender, combine garlic, jalapeno, lime juice and salt. Allow to sit for several minutes to meld flavors. Add half of broth and cilantro. Blend until fairly smooth but with a little texture, then add remaining broth and blend just enough to incorporate it. Reserve. Even though this is a one-dish meal, two-pan cooking makes preparation faster–vegetables simmer-steam in one pan while the fish cooks in another. 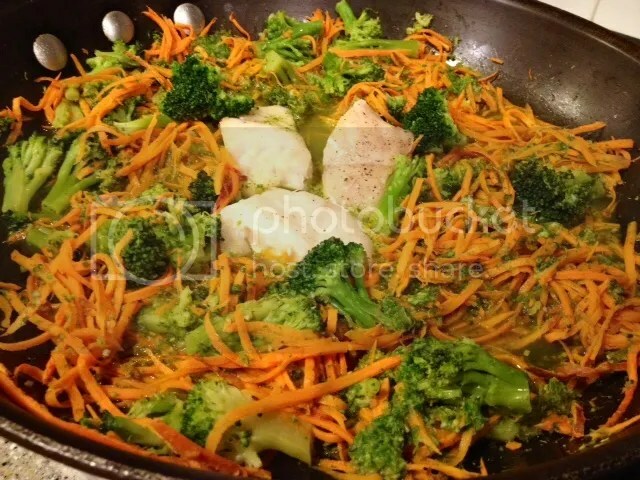 Combine broth and broccoli florets in a large frying pan with a lid. Cover, bring to a boil, then reduce heat t o low and simmer just 3-5 minutes, until broccoli is halfway done. Stir in yam strips and continue simmering until both broccoli and yams are almost done to taste, about 3-5 more minutes. 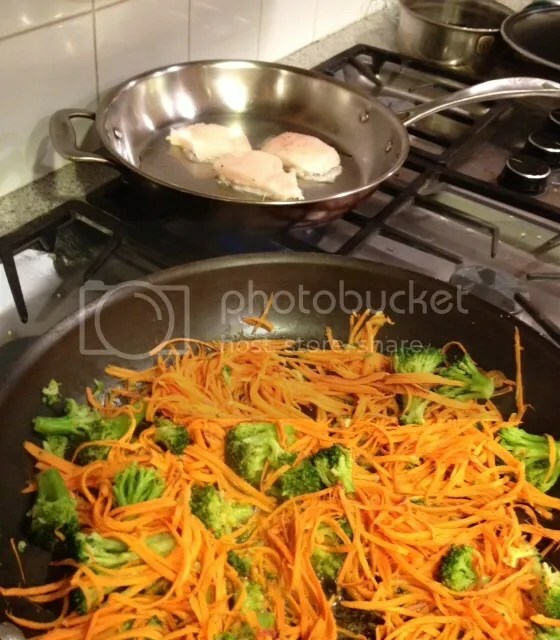 While vegetables cook, warm oil over medium heat in a medium-sized, heavy bottomed saute pan. Gently squeeze or pat cutlets dry, then season with salt and pepper. When a corner of fish sizzles gently when touched in warming oil, use a spatula to spread oil evenly over bottom of pan, then lay cutlets in warmed oil in a single layer so they do not touch each other. Set timer and cook for 3 minutes and flip over. Reduce heat to medium low and cook another 1 minute, then remove immediately to a plate. As soon as vegetables are almost done, stir in reserved sauce, then push vegetables to sides of pan and lay partially cooked cutlets in center. Continue simmering, covered, just 1-2 more minutes, until fish is done. Taste and add more salt, pepper, lime or jalapenos, to taste. Serve immediately, placing two or three cutlets in center of wide soup bowl surrounded by half of the vegetables. Spoon broth over the top. NOTES: See the next post for background information on preparing this recipe.